A weekend with no plans other than the footy (great result) and the rugby (not so great a result) - and the fact that I'm in Birmingham (boys night away) and Cardiff (stag doo) the next two weekends - gave me an excuse to have a quiet one and a go at whittling down my beer stash slightly. Including ticking another beer from "1001 Beers...". Style: Belgian Ale. ABV: 4.5%. From: Lighthouse Wines. Description: Poured a pale yellow, cloudy, with a decent white head. Definite hoppy herbal aroma, mixed with some Belgian yeast. Starts off with the funky yeasty taste, but quickly the hops catch-up. There's a dry orange pithy bitterness here that builds up as you work your way through the beer. Light but a little stickiness. Thoughts: Quite hoppy for the style. Light and refreshing to start, with a decent herbal bitter kick. I'd buy again but wouldn't go out of my way to get it. Style: IPA. ABV: 6.7%. From: Lighthouse Wines. Description: Deep amber, hazy, decent white head. Aroma of pine, grassy hops, citrus, maybe some peach and other stone fruit. Taste is led by quite a smooth honey/caramel malt, piny hops, and again some peach. Medium bodied, resin like mouth-feel. Thoughts: Another great beer from Sierra Nevada. I was expecting a big tropical hop bomb, but actually this was a bit more subtle and balanced than that. Tasty stuff, though not as good as the Northern Hemisphere Version for me. Style: Stout. ABV: 4.7%. From: Lighthouse Wines. Description: Dark muddy brown, translucence, with a beige head. Aroma of coffee and burnt malt. Taste follows aroma, light coffee, slightly bitter-sweet, quite dry. Surprisingly light. Thoughts: Didn't do much for me, too light, too thin, and where the hell was the cranberry promised on the label? More brews to follow later this week including the excellent Kinnegar Maddyrow, Thornbridge Tzara, and Kernal's London Sour. 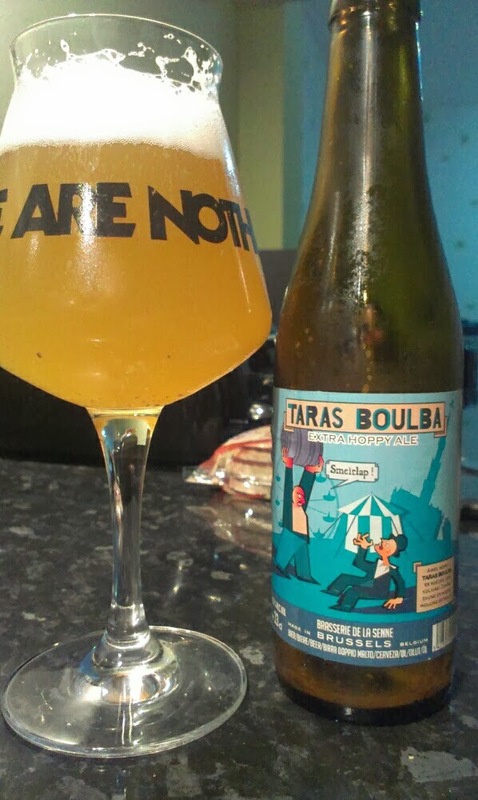 Speaking of London Sour, it features in this week's Beer Club Belfast which is all about sour beers - get down there to turn your mind, and your palette, upside down. Finally grateful for any hints and tips for good beer in either Birmingham or Cardiff - BrewDog Birmingham is already on the list but need to try a few other places with a local feel too.